(8) Maitreya said: 'He, who by the treasure king of all kings [the ruler of the Yakshas] was offered a benediction, asked, as a first class intelligent and thoughtful devotee of the Lord, for the continuous remembrance by which one without difficulty crosses over the unsurpassable ocean of nescience. (9) Kuvera, the son of Idavidâ, who was very pleased with Dhruva's mentality, granted him that remembrance and next disappeared from sight. Dhruva then also returned to his capital. (10) He thereafter worshiped, by means of sacrificial ceremonies and great charities, with all that he had, he could accomplish and the divine support that he could find, the Ruler of all Sacrifices, the objective [of one's life] who awards all results. (11) Uninterruptedly rendering service unto the one infallible Soul above all, he saw all living beings as present in Him alone and Him Almighty as the one and only present within all living beings. (12) Thus endowed with godly qualities he, who as a kind protector of the principles of dharma had respect for the brahmins and the poor, was considered the father of the people. (13) During the thirty-six thousand years of his rule over the planet Earth he by enjoyment exhausted his merits and by austerity diminished his misfortune. (14) Thus free from agitating his senses the great soul [life after life] for many, many years favorably executed the three kinds of civil duties [the regulation of religion, economy and sense gratification], after which he handed the royal throne over to his son. (15) He realized that this universe, consisting of His external energy, was a phantasmagoria to the soul, something that, just like a dream, is a result of ignorance. (16) He considered everything created comprising his body, his wives, children, friends, his influence, riches, the pleasure grounds, the facilities for his women and the complete of the beauty of the earth with its oceans, as something bound to time and for that reason he left for Badarikâs'rama [the Himalayan forest]. (17) There he purified his body by bathing in pure water and, fixed in yogic postures, controlled the breathing process by withdrawing the mind from his physical senses. Concentrating on the exact form of the Lord he constantly kept in mind, he thus meditating became fully absorbed. (18) Constantly engaged in his devotion for Lord Hari, the Supreme Personality of Godhead, he was of an everlasting bliss and was time and again overcome by a stream of tears that made his heart melt and made all the hairs of his body stand on end. He no longer remembered that he had a body and was thus liberated from [also the subtlety of] being materially bound [mukta-linga]. (28) Sage Maitreya said: 'Having heard the words that like honey poured from the chief associates of the Lord, he who was so dear to Him, took a purifying bath and performed his daily duties. Thereupon he greeted the sages and accepted their blessings. (29) After with prayers having circumambulated that excellent heavenly vehicle and also having paid the two associates his obeisances, he, whose form shone with a golden effulgence, was ready to get on board. (30) The son of Uttânapâda thereupon saw death personified approaching him. He put his foot on his head and thus ascended the wonder that was as big as a house. (31) At that moment kettledrums, mridangas [drums of worship] and small drums and such resounded, while the chief heavenly singers sang and flowers showered like rain. (32) When he was about to ascend to the heavenly abode, Dhruva remembered his mother Sunîti and thought: 'How can I go to the difficult to attain world above all worlds and leave my poor mother behind?' (33) Understanding Dhruva's worries, the two superior beings of enlightenment pointed out to him that she in her divinity had preceded him on the path. (34) On his way being covered by flowers that here and there by the demigods full of praise were showered upon him from their heavenly vehicles, he passed one after the other all the heavenly spheres [or planets]. (35) In his vimâna rising above the three worlds and even going beyond the great sages, Dhruva, who had attained eternal life, then reached the abode of Lord Vishnu. (36) Radiating by its effulgence that place illumines from within all the three worlds everywhere and also makes them radiate. It can only be reached by those who constantly engage in welfare activities and not by those who are not merciful with other living beings. (37) Peaceful, equipoised, pure and pleasing to all living beings do they, who are befriended with His devotees, easily reach the abode of the Infallible One. (38) Dhruva, the son of Uttânapâda who, fully devoted to Krishna, found his purity, thus became the crown-jewel of the three worlds. (39) The sphere of the luminaries [the galaxy], being connected with great force and speed, unceasingly encircles that place, oh Kaurava [Vidura's family name], like being a herd of bulls moving around a central pole. (44) Maitreya said: 'I have told you everything you asked me here about the great and famous character of Dhruva, who is so very much appreciated by many [a devotee]. (45) [To hear] this bestows wealth and repute, increases one's lifespan and is so greatly sacred and auspicious that one can even attain Dhruva's heaven with it, pleasing as it is to the mind and glorious in counteracting all kinds of sin. (46) Repeatedly listening to it with faith one will develop devotional activities dear to the Infallible One and therefrom there is bound to be the full defeat of all hindrances. (47) For the one who hears it there are the qualities of his good conduct and such; the story constitutes [a source of] strength for souls seeking strength and is [a breeding ground for] the honor of those who are thoughtful. (48) Carefully sing, in the company of twice-born souls, in the morning and the evening, the glories of the sacred renown and great character of Dhruva. (49-50) At the time of a full moon or a new moon, on the day after Ekâdas'î [the twelfth day of a lunar month], when the S'ravana star appears, at the end of a tithi [a lunar day], on a day called Vyatîpâta, at the end of the month or on a holiday [relative to the sun] you should recount the story to a receptive audience without desiring remuneration and take shelter of the lotus feet of Him who is the Refuge of the Seeker. You will find your mind then pacified by the soul and thus become perfect. (51) He who imparts this knowledge to souls unaware of the original reality, walks the path of truth and immortality and will be blessed by the gods for being a kind protector of the seekers. (52) Oh best among the Kurus, thus was my description of the activities, the fame and the great purity of Dhruva who, as a child forsaking his toys and his mother, left home and found the shelter of Lord Vishnu.' "
Third revised edition, loaded September 2, 2017. Maitreya said: 'Having learned that Dhruva's anger had lingered and that he had refrained from killing, Kuvera, the master of the treasury who is worshiped by the Câranas, Kinnaras [singers and indwellers of heaven] and Yakshas, appeared there and spoke to Dhruva who stood with folded hands before him. The master of the treasury said: 'Oh son of the ruler, I am very glad with you, oh sinless one, because you under the instruction of your grandfather gave up the enmity that is so difficult to avoid. Factually, you did not kill the Yakshas, nor did the Yakshas kill your brother; it is the Time that is the master of annihilation and generation of all living beings. I wish you all good fortune, oh Dhruva, keeping that in mind, live for the worship of the Supreme Lord Beyond the Senses of all living beings and think of Him in the form of the one Supersoul residing within all that lives. Be of devotion unto Him whose lotus feet deserve it to be worshiped, for they deliver you from a material existence and cut through the knot of being materially entangled. Even though He in His potency of ruling the modes is connected to them, He by His inconceivable nature is aloof from them. Maitreya said: 'He, who by the treasure king of all kings [the ruler of the Yakshas] was offered a benediction, asked, as a first class intelligent and thoughtful devotee of the Lord, for the continuous remembrance by which one without difficulty crosses over the unsurpassable ocean of nescience. Kuvera, the son of Idavidâ, who was very pleased with Dhruva's mentality, granted him that remembrance and next disappeared from sight. Dhruva then also returned to his capital. He thereafter worshiped, by means of sacrificial ceremonies and great charities, with all that he had, he could accomplish and the divine support that he could find, the Ruler of all Sacrifices, the objective [of one's life] who awards all results. Uninterruptedly rendering service unto the one infallible Soul above all, he saw all living beings as present in Him alone and Him Almighty as the one and only present within all living beings. Thus endowed with godly qualities he, who as a kind protector of the principles of dharma had respect for the brahmins and the poor, was considered the father of the people. During the thirty-six thousand years of his rule over the planet Earth he by enjoyment exhausted his merits and by austerity diminished his misfortune. Thus free from agitating his senses the great soul [life after life] for many, many years favorably executed the three kinds of civil duties [the regulation of religion, economy and sense gratification], after which he handed the royal throne over to his son. He realized that this universe, consisting of His external energy, was a phantasmagoria to the soul, something that, just like a dream, is a result of ignorance. There he purified his body by bathing in pure water and, fixed in yogic postures, controlled the breathing process by withdrawing the mind from his physical senses. 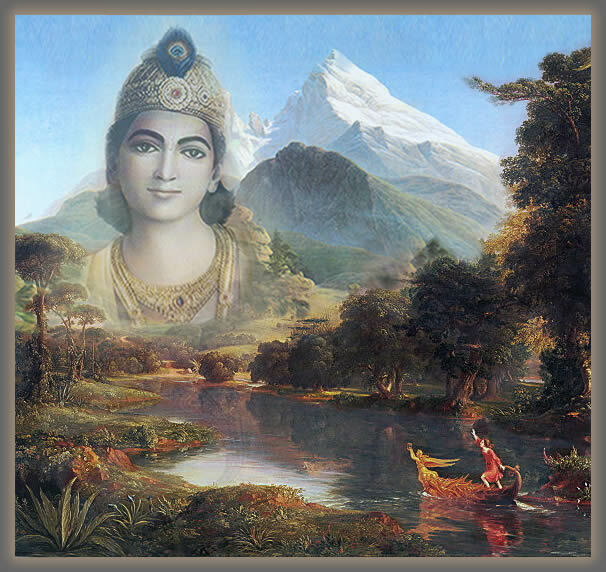 Concentrating on the exact form of the Lord he constantly kept in mind, he thus meditating became fully absorbed. Constantly engaged in his devotion for Lord Hari, the Supreme Personality of Godhead, he was of an everlasting bliss and was time and again overcome by a stream of tears that made his heart melt and made all the hairs of his body stand on end. He no longer remembered that he had a body and was thus liberated from [also the subtlety of] being materially bound. Dhruva saw a very beautiful heavenly vehicle [a vimâna] descending from the sky that illumined him and the ten directions as if the full moon itself had appeared. Therein he discerned two beautiful demigods with four arms, a blackish skin, being quite young and with eyes as pink as a lotus flower. They held clubs and were attractively dressed and decorated with helmets, bracelets, necklaces and earrings. Understanding them to be two servants of the Renown One, he stood up, but being puzzled he did not know anymore how to receive them with proper respect and thus he respectfully joined his hands offering his obeisances by chanting the names of the chief of these associates, the Enemy of Madhu. He whose heart was always absorbed in thoughts of the feet of Lord Krishna, very humbly folded his hands and bowed his head, while Nanda and Sunanda, the two chief servants of the One with the Lotus navel, smilingly approached and addressed him. Nanda and Sunanda said: 'Oh best of kings! All good fortune to you. Listen attentively to our words. You are the one who, being five years old, greatly satisfied the Lord by doing penance. We, as the associates of the creator of this entire universe, of the Godhead who carries the bow named S'ârnga, have approached you to take you with us to the abode of the Lord. You have achieved the world of Vishnu, so difficult to achieve that not even the greatest souls of enlightenment can reach there. Come and see the supreme abode around which to the right the moon, the sun, the other planets and the stars are circumambulating. This has never been achieved by your forefathers nor by others, oh dear man, come and live there in that supreme abode of Lord Vishnu who is so worshipable for the inhabitants of the universe. Sage Maitreya said: 'Having heard the words that like honey poured from the chief associates of the Lord, he who was so dear to Him, took a purifying bath and performed his daily duties. Thereupon he greeted the sages and accepted their blessings. After with prayers having circumambulated that excellent heavenly vehicle and also having paid the two associates his obeisances, he, whose form shone with a golden effulgence, was ready to get on board. The son of Uttânapâda thereupon saw death personified approaching him. He put his foot on his head and thus ascended the wonder that was as big as a house. At that moment kettledrums, mridangas [drums of worship] and small drums and such resounded, while the chief heavenly singers sang and flowers showered like rain. Understanding Dhruva's worries, the two superior beings of enlightenment pointed out to him that she in her divinity had preceded him on the path. On his way being covered by flowers that here and there by the demigods full of praise were showered upon him from their heavenly vehicles, he passed one after the other all the heavenly spheres [or planets]. In his vimâna rising above the three worlds and even going beyond the great sages, Dhruva, who had attained eternal life, then reached the abode of Lord Vishnu. Peaceful, equipoised, pure and pleasing to all living beings do they, who are befriended with His devotees, easily reach the abode of the Infallible One. Dhruva, the son of Uttânapâda who, fully devoted to Krishna, found his purity, thus became the crown-jewel of the three worlds. The sphere of the luminaries [the galaxy], being connected with great force and speed, unceasingly encircles that place, oh Kaurava [Vidura's family name], like being a herd of bulls moving around a central pole. Having observed Dhruva's glories, the wise and great lord Nârada played his stringed instrument in the sacrificial arena of the Pracetâs, chanting [the following] verses. Nârada sang: 'Due to his austerity this son of Sunîti, who served her husband so devotedly, could attain that position. Not even those whom one calls the followers of the Vedas are, despite their awareness of the means, certain of such an attainment, not to mention the chances of regular human beings. He who at the age of five years, aggrieved about the harsh words of the wife of his father, in pursuance of my instruction, deeply pained in his heart went to the forest, won over the Supreme Master, winning with the qualities of His devotees. Maitreya said: 'I have told you everything you asked me here about the great and famous character of Dhruva, who is so very much appreciated by many [a devotee]. [To hear] this bestows wealth and repute, increases one's lifespan and is so greatly sacred and auspicious that one can even attain Dhruva's heaven with it, pleasing as it is to the mind and glorious in counteracting all kinds of sin. Repeatedly listening to it with faith one will develop devotional activities dear to the Infallible One and therefrom there is bound to be the full defeat of all hindrances. For the one who hears it there are the qualities of his good conduct and such; the story constitutes [a source of] strength for souls seeking strength and is [a breeding ground for] the honor of those who are thoughtful. Carefully sing, in the company of twice-born souls, in the morning and the evening, the glories of the sacred renown and great character of Dhruva. At the time of a full moon or a new moon, on the day after Ekâdas'î [the twelfth day of a lunar month], when the S'ravana star appears, at the end of a tithi [a lunar day], on a day called Vyatîpâta, at the end of the month or on a holiday [relative to the sun] you should recount the story to a receptive audience without desiring remuneration and take shelter of the lotus feet of Him who is the Refuge of the Seeker. You will find your mind then pacified by the soul and thus become perfect. He who imparts this knowledge to souls unaware of the original reality, walks the path of truth and immortality and will be blessed by the gods for being a kind protector of the seekers. Oh best among the Kurus, thus was my description of the activities, the fame and the great purity of Dhruva who, as a child forsaking his toys and his mother, left home and found the shelter of Lord Vishnu.' "
against the backdrop of the mountains of 'Der Watzmann' by Caspar David Friedrich 1824-1825 (Source).